A white supremacist finds reality in prison, but comes home to a family still riddled with hatred. It was with great trepidation that I went to see this film. I expected confrontation, which I did find, and violence, which is also there; but the film was not overwhelming. It is a story of redemption, a tale of how one man became a white supremacist, and how it affected his family, and his future. 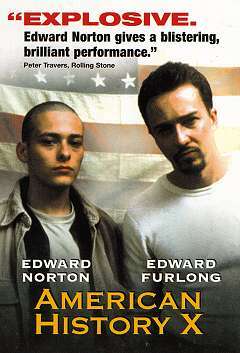 This film has been used in the US as a teaching tool by Amnesty International. I found a bit of extra fun playing 'spot the Star Trek actor'. Unfortunately Avery Brooks, who gets to play a pivotal moment in the film is making his point while the audience is still adjusting to the previous gruesome scene. Scriptwriter David McKenna grew up in an aggressive hate-filled environment, "I saw a lot of bigotry growing up, and it made me think about writing something about the world of hate-mongers. The point I tried to make in the script is that a person is not born a racist. It is learned through environment and the people that surround you. The question that intrigued me is: why do people hate and how does one go about changing that? My premise was that hate starts in the family." "I had seen documentaries that just didn't ring true to me, and I wanted to write an accurate portrayal of how good kids from good families can get so terribly lost." Producer John Morrissey was attracted to the scrip's message, "I responded to the fundamental subject matter of racism and how it destroys individuals, families and communities, and by extension entire societies." I loved the movie I saw it on video a week ago and want to see it again immediately. It was such a great story that had a superb ending that I feel that you should all see as soon as possible. If you have any doubt as to the brutal ends that racism can go you should check this movie out! !